Home » Groundhog News » Dunkirk Dave: SUPERSTAR! 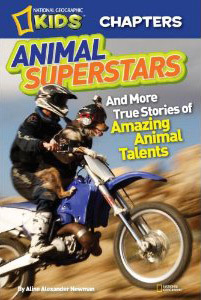 Dunkirk Dave was chosen as an “animal superstar” and his special life will be featured in print and pictures in one of the three chapter animal stories in the National Geographic Kids Chapters book series, Animal Superstars: And More True Stories of Amazing Animal Talents. The chapter book with a release date of February 12, 2013. You can pre-order the book at Amazon.Com or Barnes & Noble. The book is available in paperback, hardcover and Kindle & Nook Book eBooks.